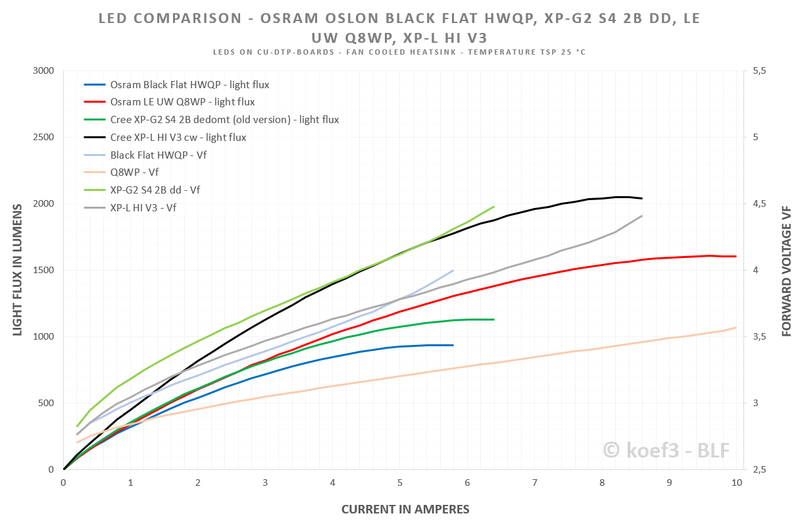 LED test / review - OSRAM OSLON Black Flat HWQP - still highest luminance of all LEDs to date! Since several months this LED is a well-known and popular choice for ultra-long range distance flashlights (throwers). Many performance values are already known from other users / tests, but with this test / review I want give you and all these who want to start a project with this very interesting LED the opportunity to check all values and important informations in one single post. Optical / electrical simulations and CAD files can be also found at Osrams homepage. 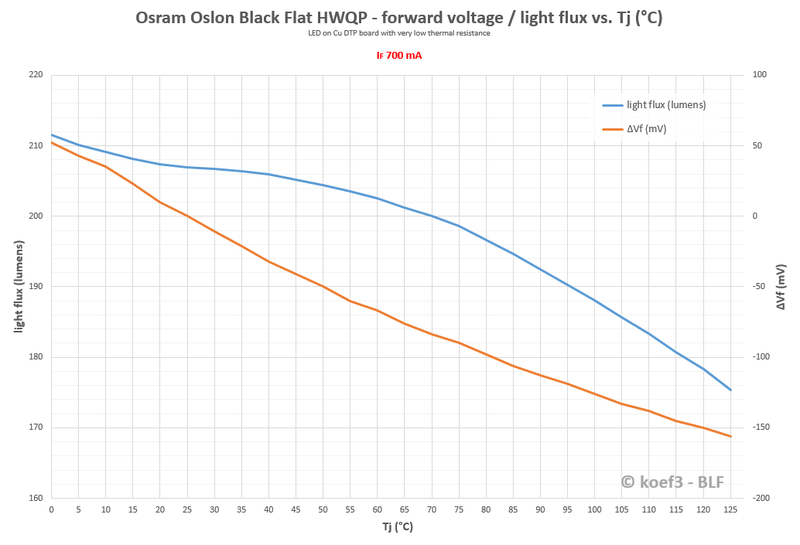 The Oslon Black Flat is a 3.75 x 3.75 x 0.5 mm LED. The housing is made of black epoxy which has every Oslon Black LED. Because of the domeless design the Black Flat appears very flat, like the name says. The yellow LES is embedded in a white area which offers a great avdantage in the mechanical stability – the risk of damaging a silicon layer or dome in case of mishandling is greatly reduced. The Black Flat has a thermal pad, which is unfortunately NOT electrically isolated, a very annoying feature which makes soldering on DTP boards more complicated. It requires that the board or the driver is mounted electrically isolated from the flashlight body otherwise the LED will run in direct drive mode and maybe could destroyed or the life span is greatly reduced. Despite Osram using an own footprint type (3030), the Black Flat fits on XP boards. 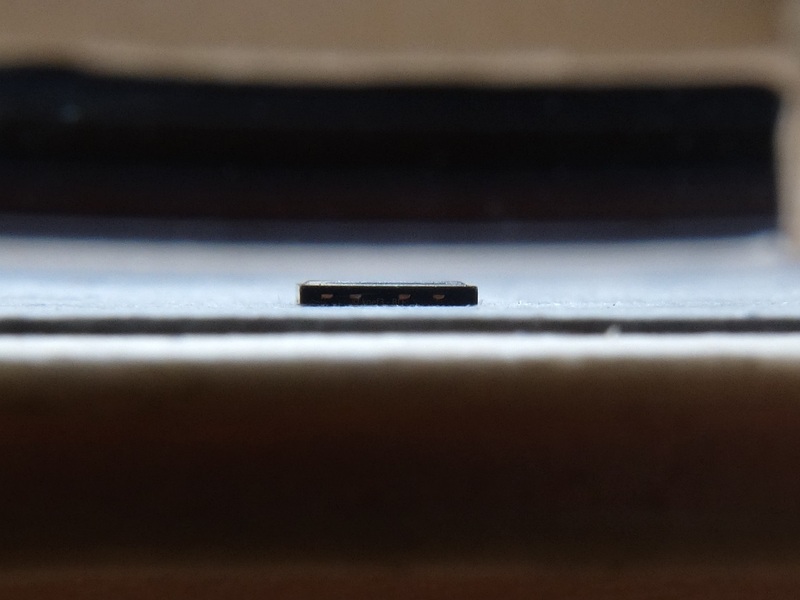 The emitter doesn’t seat itself, and it is strong recommended not using too much solder paste that squeezes out sideways in reflow procedure and cause shorting the contacts. 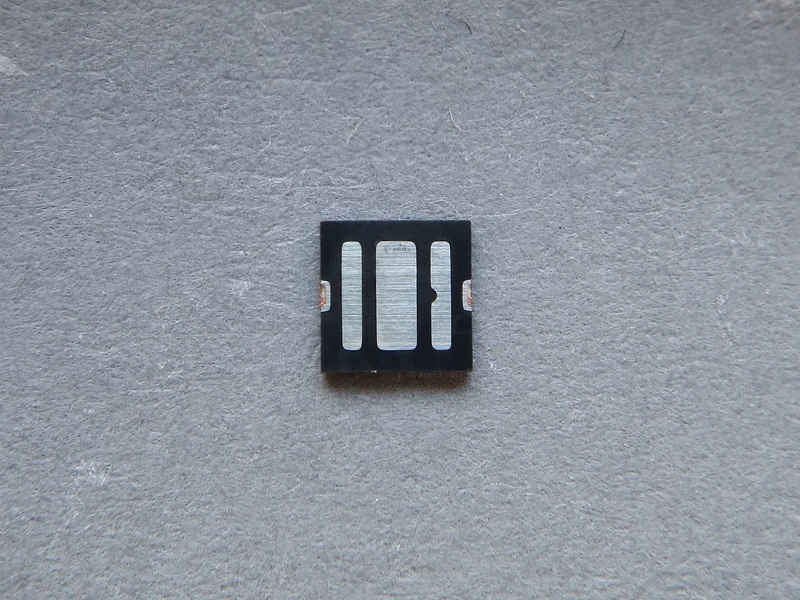 The Black is based on the Osram UX:3 platform, the chip was designed in classic lateral style. The white opaque outline doesn’t affect the light at all. In one corner (where the bonding wire is attached) the LES appears like ‚bitten off‘ which should have no influence of the beam. 25 °C Tsp, unless noted otherwise. In ‚real life applications‘ this values may vary. In the diagramm it can be easily discerned that the voltage raises sharply, probably due to increasing electrical resistance of the bonding connection wires at highest currents. At such a behavior the burning of this wires can be expected. From this point I cannot recommend the operation at such high currents because it significantly shorten the LED’s lifespan. One sample was destroyed in my previous testing at 5,400 mA (burnt wires), even before reaching it’s maximum flux. For real-life applications with maybe less efficient cooling systems it is also absolutely crucial to check the behavior of Vf rising and the maximum current used for this application, to prevent the LED from self-destroying. The operation with FET-based (direct drive, DD) driver electronics should be avoided because the Vf is relatively low and the absolute maximum current of approx 4,800 to 5,200 mA could be exceeded very easily, depending on the quality and performance values of the battery used.  From now on I using a new method for determining luminance, especially to ensure more realistic values for 'real-life' conditions (flashlight use). The measurements are taken with a new original Convoy C8 SMO reflector, but with same test setup as previously used in flux measurement. In the last months the Black Flat has become a very popular choice for ultra-long range lighting systems (throwers) due to it’s very high luminance which currently represents the maximum of commercial available (and not expensive) emitters. The luminance is approx 22 percent higher as of the old dedomed XP-G2 S4 and approx 45 percent higher than of the highest bin XP-L HI (V3). 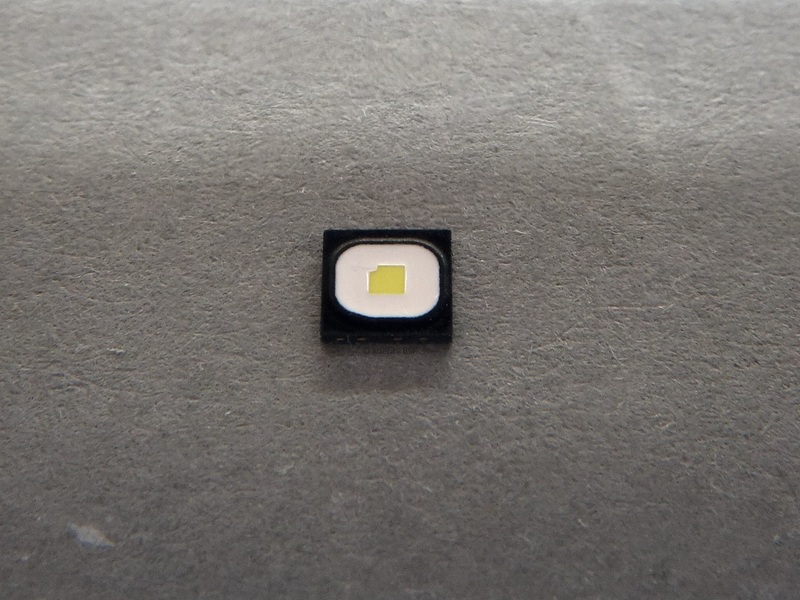 In general, there are no issues for using this LED in smooth or peeled reflectors, even with (aspheric) lenses. The notch in one corner of the LES does not affect the beam pattern at all even you can see it if used with aspheric lenses. Because of the high luminance and very small LES it is absolutely necessary to center this LED as precisely as possible to ensure a nice beam pattern. Like other LEDs with high luminance the tint is a blueish cool white. Even compared to standard 70 CRI light sources (XP-L / XM-L2 cool white used often in flashlights) the color rendition is very low due to very low flux in cyan / deep red, so red and green are not good reproduced which is still normal for cool white light sources in this color rendering class. 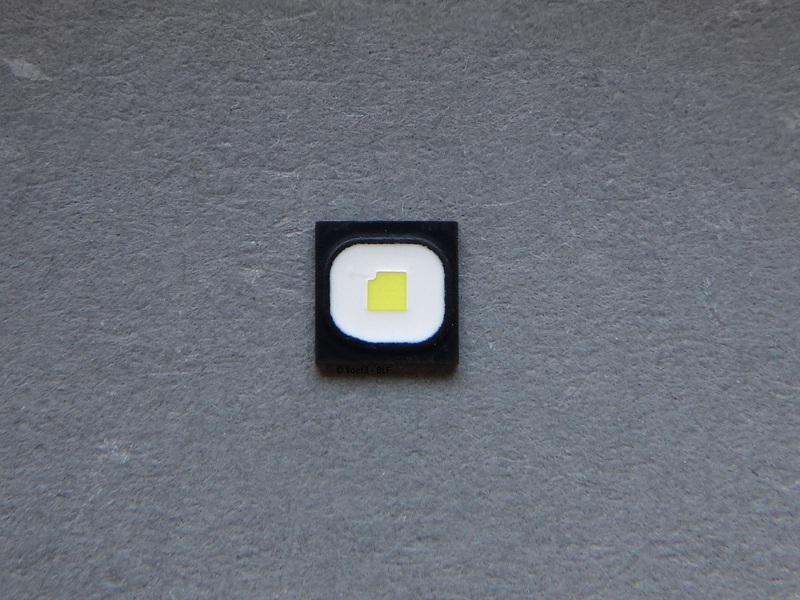 The Black Flat features the highest luminance of all commercial available LEDs to date, which makes it extremely interesting for special applications where the absolute throw is desired. Also the beam pattern is good, even in SMO reflectors. Due to it’s own Osram 3030 footprint the reflow procedure is a bit more difficult as we know from classic XP LEDs, and the tint is a blue cool white with no good color reproduction which should be negligible for this application. Also I did not like the electrical connected thermal pad which makes the use of DTP boards more complicated. You measure a bit higher max at a bit higher current than my test two years ago, which probably proves again the imperfectness of the cooling of my led-mount. But another possibility is that this led has got slightly better specs in those 2 years. After some weeks of extensive testing and many test runs I managed to measure differences in light flux and Vf depending on Tj / Tsp. I put a lot effort to make the thermal resistance from emitter to heatsink as low as possible to avoid errors. For the next upcoming emitter tests I will publish also diagrams / measurements like this. Did you use a peltier to get below ambient? That will get us another important piece of information about abusing our leds. Yeah, peltier. But it’s not the best way to regulate emitter temperature. Here is a relative brightness measurement of my Project Excalibur light with a Black Flat @ ~4.5A on copper pcb screwed on a (hollow) copper rod in a large aluminium host in a closed cupboard (so the air was not moving much and slowly getting warmer). I did not cool the light in any way and let it run for the entire 1.8h. The LED is being run at it's absolute maximum brightness. The problem is that this was determinend under almost ideal conditions on a large, cold heatsink. As the light slowly warms up, the brightness decreases by a lot. There is definitely a bottleneck though, the decrease in the first 10min is way too big imho. I also have to say though that this is my first light where the LED is actually being driven at its absolute maximum. That could make a big difference. Of the light? It’s linked in my signature. I don’t want to clutter your thread. Ok, thanks. This picture is not visible in your post earlier. Has the pic supposed to be there? Maybe you could using an external image hoster to avoid such problems? I don’t like external image hosters. Can you see the pics in the lights thread? They are all hosted on TLF. Many people can see them, as can be seen in the comments. Even google has already found this pic. Raw data of more emitter tests will follow in the next time. Stay tuned! Can you also upload the data for the Cree XP-G2 S4 “old” that I gave you? I would really appreciate that! 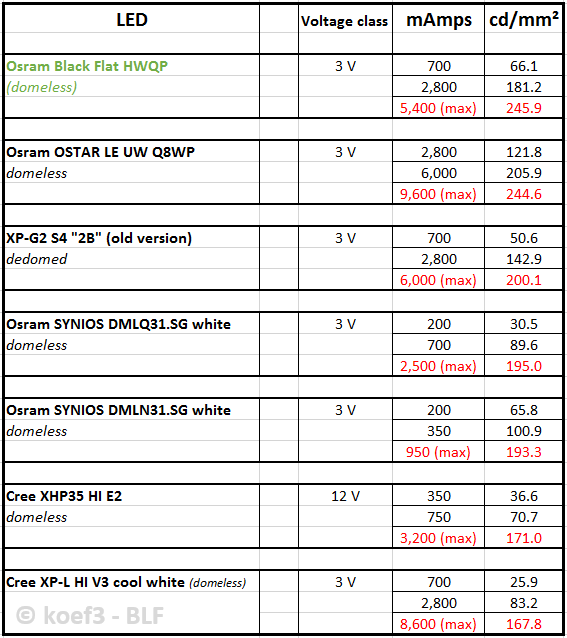 In May Osram released a new version (1.10) of the datasheet. The performance of the LEDs has been improved. There is now a higher maximum bin (12.5% brighter) and the lowest one has been removed. This should lead to a higher maximum luminance. @koef3: can you also post the data of Cree XP-E2 Torch de-domed?